With Egypt on the eve of another potentially massive demonstration, it is time to pull these pictures out from the archive. 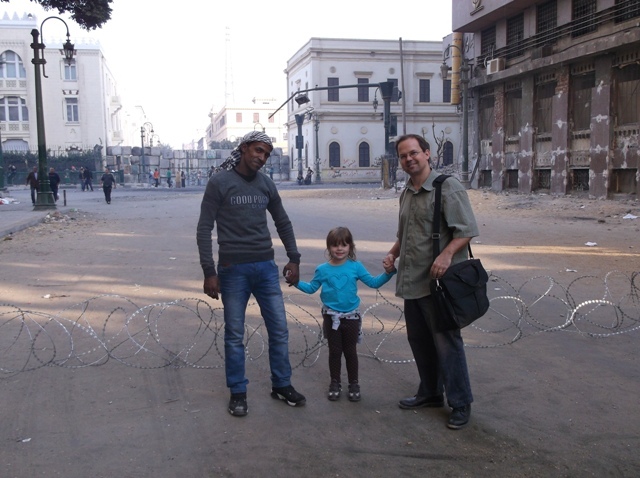 They are from the day I took my four year old daughter and her grandfather to Tahrir. I didn’t post them immediately, as I didn’t want to scare the rest of the extended family. And to set hearts at ease, I don’t plan to take anyone tomorrow. It is hard to recall all the events of Tahrir, but on that occasion there were once again clashes – the night before. My parents were visiting to help assist with the birth of our new son; of course my father had to see the famous square. The best time to avoid violence is morning, when all are exhausted from fighting through the night. ‘I smell nail polish remover,’ said Hannah, my daughter. She was sort of right; I had never noticed how it resembled the scent of lingering tear gas. ‘What pretty decorations,’ she said. I looked all around, wondering if she was referring to the graffiti, some of which is rather creative. ‘No, the shiny ones,’ and she pointed toward the middle of the road. Ah, barbed wire. Some lessons I explained, others were left unsaid. My children are getting quite an education in Egypt. 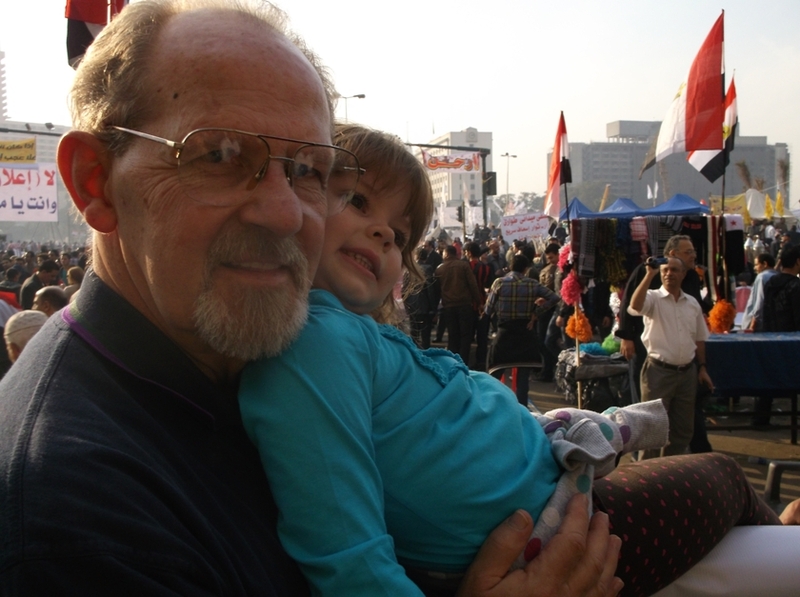 As for my father, he was particularly impressed by an incoming march as we exited the square along Kasr al-Nile Bridge. ‘Such passion,’ he remarked. We even got a quick glance of Hamdeen Sabbahi’s silver locks as he accompanied the procession to Tahrir. As for tomorrow, the two year anniversary of the start of the revolution, expectations are meaningless. 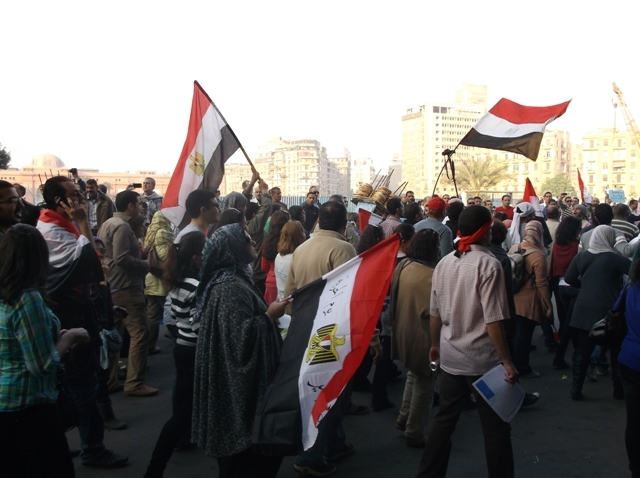 Tahrir could be packed, or victim of protest fatigue and sullen resignation. It could spark a second revolution against the Muslim Brotherhood, or descend violently into anarchy and chaos. Here’s hoping for a protest without nail polish and decorations. « Who are the Salafi-Jihadis?